In May 2003, the first official Collingwood Days celebration took place at the Safeway parking lot at Tyne and Kingsway. Before then, a group of creative community-minded residents had been putting together yearly events to bring people together in shared experiences. In 2000, there was Faces of Our Neighbourhood, an initiative that led residents on a parade from Collingwood Neighbourhood House to Slocan Park for a community celebration. Mosaic Madness followed in 2001; and in 2002, residents gathered to celebrate the installation of the Renfrew Totem Pole through Nature Meets Art. The interest and need for regular community celebrations and gatherings brought about both Collingwood Days Festival and the Renfrew Ravine Moon Festival, which began September 2003. After a couple of years at the Safeway location, Collingwood Days Festival moved to the Sir Guy Carleton Elementary school site, where it remained until 2016. After the closure of the school, the festival made the move to its new location at Gaston Park. Throughout the years, the festival has highlighted the unique stories of Renfrew-Collingwood residents, and over time we have based our festival themes on these stories. We have discovered and showcased the histories of individual community members, the natural environment, artists and performers, local businesses and even our dogs! This year, we have a particularly fun theme, that of Play and Playfulness – “The quality of being light-hearted or full of fun” – and we invite community members to join in on all sorts of play and games, sports and arts alike, that are being held throughout the community. Throughout the world there is play. There are schoolyard games, board games, sports and word games. Music, performance and making art can be playful. While we often think of play as something that is only for the young, play is critical to the physical and social well-being of everyone, no matter their age. This wide-ranging theme allows us the space to celebrate ways of playing from around the world. This year, the festival week begins after the Victoria Day long weekend, on Tuesday, May 22; but you can jump-start playing by joining Family Board Games at Renfrew Library on Sunday, May 20 from 1:30 to 4:30 pm. On Saturday, May 26, Gaston Park will be the site of playful activities ranging from live musical performances such as the Wooly Bears Square Dancing, Balkan Shmalkan and Vietnamese Fan Dancers; roving performers such as Lola Loops, Birds on Parade, and Ariel Amara; art and craft making with Still Moon Arts Society and local artists; as well as games led by InterACTIVE volunteers, Tin Can Studio, and other groups. This is your chance to try out handball, bocce, backgammon, hoops, and juggling; make paper airplanes in the Artisan Village; and enjoy a variety of multicultural foods. We hope you join in the spirit of play! Categories: Arts & Culture, History, Sports & Recreation | Tags: Arts and culture in Renfrew-Collingwood, Collingwood Days, Gaston Park | Permalink. 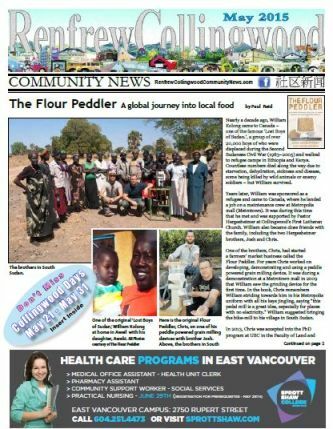 In this issue we continue to mark the 20th anniversary of the Renfrew-Collingwood Community News. Come visit our booth at Collingwood Days and celebrate with us! The deadline for the June 2018 issue is May 10. We welcome story submissions from 300 to 400 words long. Accompanying photos must be high resolution in a jpg file at least 1 MB large and include a photo caption and the name of the photographer. Categories: Archives, Past Issues | Tags: Coast Employment Program, Collingwood Days, DJ A-SLAM, humans sector, RCC News 20 years, Sharon Gregson | Permalink. The sun is shining, the flowers are blooming, the birds are chirping – spring is here at last! And that means stepping outdoors and getting together at the many events and activities happening around our neighbourhood. Here are a few ideas. Join in a community celebration. Whether it’s a school carnival, a European festival or Collingwood Days, there are plenty of fun local celebrations for the family to enjoy. Come on out and meet your neighbours and discover local talents! Explore by Skytrain. Spring is a great time to shop at local farmers’ markets, enjoy new food trucks or discover new neighbourhoods – it just takes a short hop by Skytrain to get there. For ideas check out the RCC News’ Skytrain Rambler series. Show the Renfrew Ravine some love. Still Moon Arts Society runs workshops in the Renfrew Ravine and has an online guide to ravine self-walking tours. Evergreen runs its Uncover Your Creeks program in the Renfrew Ravine once a month. Volunteer at a local garden. Dig into the opportunities at the Collingwood Neighbourhood House Rooftop Garden or the Norquay Learning Orchard, run by the local Food Security Institute. Join a walking club. Drop by your local community centre or neighbourhood house to find a walking club or group day trip program that’ll take to you near and far. The group taking the Killarney Community Centre trip to the Reifel Bird Sanctuary in late March saw gorgeous birds such as these sand cranes and mallard ducks. Julie Cheng is the editor of the Renfrew-Collingwood Community News. She has lived in Renfrew-Collingwood for 20 years and loves to get some vitamin D from the sun while gardening, cycling or walking outdoors. Categories: Arts & Culture, Health & Wellness, Sports & Recreation | Tags: Collingwood Days, Killarney Community Centre, Reconciliation Pole Raising, Renfrew Collingwood Food Security Institute, Renfrew Ravine, Skytrain, UBC | Permalink. Let’s get outside and celebrate spring! The deadline for the June 2017 issue is May 10. We welcome story submissions from 300 to 400 words long. Accompanying photos must be high resolution in a jpg file at least 1 MB large and include a photo caption and the name of the photographer. Categories: Past Issues | Tags: Adult education time machine, Captain's Boil, Coastal City Ballet, Collingwood Corner, Collingwood Days, Eating Out in RC, Graham Bruce Elementary, John Mendoza, Loretta Houben, Windermere high school | Permalink. The deadline for the June 2016 issue is May 10. You are welcome to submit a story from 300 to 400 words. Accompanying photos must be high resolution in a jpg file at least 1 MB large and include a photo caption and the name of the photographer. Categories: Health & Wellness, History, Past Issues, People, Sports & Recreation | Tags: Collingwood Days, Eileen Zheng kidney donor, Graham Bruce Spring Carnival, Il Museo, Shelley Stefan | Permalink. The deadline for the June 2015 issue is May 10. You are welcome to submit a story from 300 to 400 words, with high resolution photos in a jpg at least 1 MB file size. Categories: Archives, Past Issues, People | Tags: Cinderella, Coastal City Ballet, Collingwood Days, First Lutheran Church, Green Thumb Theatre, Mother's Day, Susan Wong, The Coat Room, The Flour Peddler, Windermere high school | Permalink. Get your April 2015 issue of the RCC News at your local coffee shop, grocery store, library and community centre. The deadline for the May 2015 issue is April 10. You are welcome to submit a story from 300 to 400 words, with high resolution photos in a jpg at least 1 MB file size. Categories: Archives, Past Issues | Tags: Ching Ming, Collingwood Days, Collingwood Neighbourhood House, Don McLellan, Easter, Places, RC INTERactive, Spaces and Faces | Permalink.